This weekend, the museum’s monthly Bank of Hawaii Family Sunday event focuses on music. At Sing Out! kids can make instruments, go on a music-inspired Gallery Hunt (looking for things such as Harry Bertoia’s Sounding Sculpture), and hear musical groups—including the Hawaii Youth Symphony. Created in 1964, the Hawaii Youth Symphony (HYS) is one of the largest youth orchestra organizations in the country, serving students age 7 to 18 in nearly 100 schools throughout the state, and offering free performances for more than 10,000 school children every year. 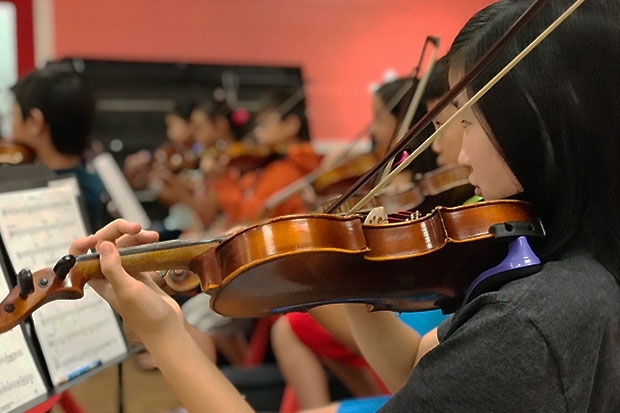 In addition to learning traditional classical music, HYS students also have opportunities to collaborate and perform with well-known Hawai‘i artists such as Willie K, Jake Shimabukuro, and the Brothers Cazimero. Just as HoMA strives to foster lifelong supporters of art, HYS strives to create positive learning experiences and build lifelong supporters of music. Executive director Randy Wong believes that “musical studies engender children to be passionate, inspired, and caring students,” and hopes they carry these values with them throughout their lives. HYS envisions a Hawai‘i where all young people benefit from music education. In addition to the seven youth orchestras that recruit students through auditions, HYS also operates a robust outreach program—offering music education through organizations like the Boys and Girls Club, free community concerts, and programs for students with no prior musical experience. “We also recognize that the cost to participate is often a barrier, and we offer scholarships and financial aid programs so that children across the state can play,” says Wong. Interested in hearing HYS live? Come to Bank of Hawaii Family Sunday: Sing Out! on March 18 to see the Concert String Orchestra—comprising Hawai‘i’s most accomplished musicians ages 8 to 18—conducted by Chad Uyehara. The performance begins at 11:15am in the museum’s Mediterranean Courtyard.